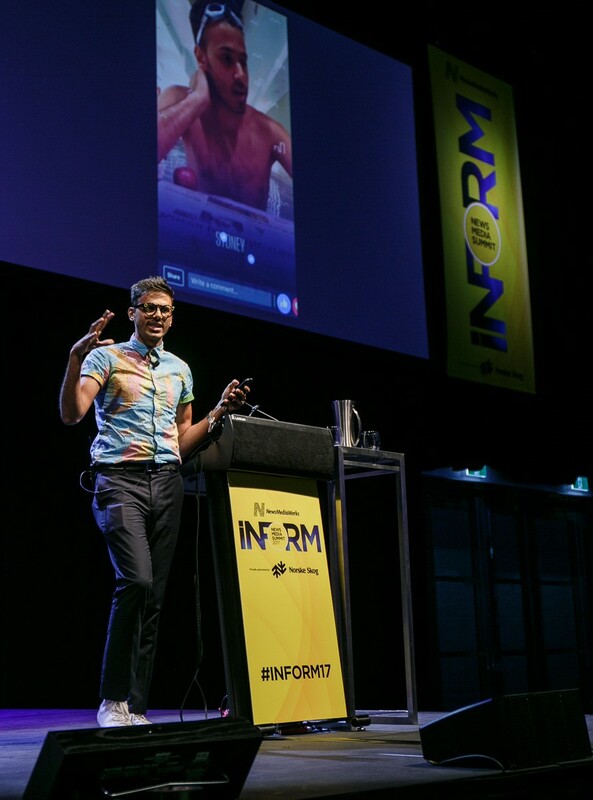 While attending the INFORM News Media Summit in Sydney yesterday, B&T pulled aside one of its speakers – Yusuf Omar, co-founder of HashtagOurStories and an ex-CNN social reporter – to talk all things mobile in the land of news media. What are some of the latest trends you’re seeing involving news media companies and mobile engagement? The first thing to appreciate is the big buzzword [or ‘buzzphrase’] at the moment, which is ‘pivot to video’, and specifically a pivot to video that is optimised for mobile devices. We’re finally seeing traditional news organisations explore formats as basic as vertical video, explainer stories, being able to sum up a video into a minute as opposed to a minute thirty or longer for television. They’re starting to appreciate the nuance that an Instagram story is not the same as a Facebook story or a Twitter or YouTube story – that each one has very specific audiences and ways of conceptualising those stories. I think that’s a shift playing out in media. News organisations are also becoming more and more efficient at repurposing one piece of video for numerous platforms. I think the ability to do that efficiently with minimal resources largely influences the success or failure of your digital strategy. Is there a standout social media platform for news organisations to use? When we look at all the social media platforms, there aren’t actually that many. You have the Facebook juggernaut, which includes Messenger, Instagram, and WhatsApp; you have Google, which expresses itself through YouTube; you have Snapchat, which is a standalone entity; and then you have new, emerging social media apps coming out of Amazon and the likes. News organisations can’t put all of your eggs in one basket – they need to diversify their social media as much as possible and be platform agnostic. If your business is based on the success of another business, it’s never a good position to be in. If Facebook changed their algorithms overnight, you’d suddenly have to jump in and re-adjust, but that’s the nature that we’ve got ourselves into. We have to play with Facebook – it is the biggest platform in the world, it has the biggest reach and audiences, and may soon offer the biggest monetisation potential. It’s about being nimble enough to respond to algorithmic changes and acknowledging that dotcom strategies are failing. We have to use this technology for what it’s good at, and Facebook is really good for distribution. Yusuf Omar presenting at the INFORM News Media Summit yesterday in Sydney. What are news media companies doing wrong when it comes to mobile engagement? I think there are a few things that they could be doing better. We’re still exporting television formats and putting them online, and this is proven regularly not to succeed. I think they’re still thinking about engagement after they’ve done the story, but I think 50 per cent of the conversation before the story is produced needs to be about the engagement. The reporter should be telling their editor or producer which conversations are going to be sparked in the comments section and which Facebook groups are going to share the story. The onus should be put on the storyteller to build that relationship. News organisations also need to better understand how to migrate audiences through social media. If they do a fantastic video on fly fishing, the next time they do another video on fly fishing, they can drop the link to it in the comments section of the first video, because they know they already have an audience that’s passionate about that subject matter and can easily migrate them. I’m also seeing major news organisations trying to build mega social accounts with five or 10 million followers. We’re entering an age where the internet’s becoming smaller and they’re better off having 100 accounts with 1,000 followers each, and knowing specifically what those groups are interested in. That makes sense to marketers too, because then they can target. News organisations and brands need to be looking at social media on a far more granular level than trying to create these big accounts with massive followings that don’t mean anything anyway. How do you rate Aussie news media organisations in terms of mobile engagement? Australia is an island and isolated in every sense of the word, and that rings true to some of the media. I’ve seen some formats here online that I haven’t seen elsewhere. I think Aussie news organisations have their own style, and that traditional media houses like the ABC and Fairfax are navigating the same difficult journey that traditional media houses around the world are facing, but I think Australia will come out on top. Australian media houses have got cash that they can throw – they’re pivoting to digital not because they have to, but because they want to, and that’s a powerful position to be in. I think here news organisations still have very loyal audiences on traditional platforms. You still have huge radio audiences in the rural areas, you still have people who are very loyal to newspapers. Australia is looking at the US and realising that it still has a couple of years to prepare, and hopefully they won’t make the same mistakes that other markets have. Are there any other practical steps that Aussie news companies can take to future-proof their newsrooms for the digital age? I think it’s about people and trust. I think they should be bringing in more young people who understand social media platforms to their boardroom meetings. There’s quite a bureaucracy in a lot of Australian news organisations, and you’ve got to sometimes have a bit of age behind you before making it to decision-making positions, when in reality, many of the people who have the best ideas in the room are not senior. We’ve reached the stage in journalism where being tech-savvy is just as valuable as being journalistically experienced. Today, you need technologists in your newsroom, and that’s why it’s important for news companies to surround themselves with Millennials who get it. How do you see the role of a journalist changing over the next 10 years? I think journalists lost the breaking news game a long time ago – 9/11 was the breaking point that where people with mobile phones were capturing the biggest stories of our time, not journalists with big cameras. I don’t think media should try to play the breaking news game either – it’s expensive, and it’s really boring. It should focus on commentary and analysis, and with so much video coming through from different social media platforms, it should focus on verification and authentication – making sense of what’s real and what’s not. That’s the value-add of news media in 2018 and beyond – the ability to be the voice of truth, but not try to be the sole arbitors of truth. We have to acknowledge that social media has a huge place in the news cycle – we can’t keep writing it off as being non-sensical. In a time when we have fake news and media houses under such pressure to monetise, we see news media positioning itself as “we’re right, they’re wrong”. They need to work together. Social media needs journalists and editors to make sense of it, and editors and journalists need social media to find stories on the ground.